I'm not sure what I was expecting when I came to Panama City in Panama. After seeing so many colonial cities in various parts of Central America, a modern, bustling city with jaw dropping skylines was far from my mind. Panama city is just that and more. Of course she boasts the much visited Panama Canal, which is well worth the time spent to see and understand the enormous scale of world shipping that goes on here. 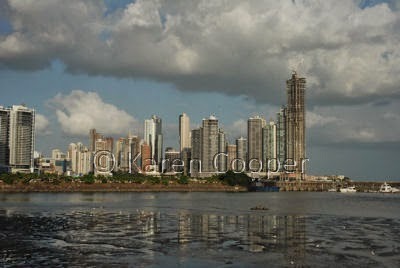 Panama City is the home of some pretty impressive highrise buildings. Lots of money here. Panama is, however, home to a whole lot of other fascinating sites, and sights. She has the impressive Caribbean Sea on one side and the Pacific Ocean on the other. She has mountain ranges, volcanoes, and various smaller cities rich in natural resources. I have to admit to be pretty awestruck by this country. From a photographers point of view, this is pure heaven. From a visitors point of view, the people are warm, friendly and extremely hospitable. From a human persons point of view, you have to come and see this country to experience it first hand and understand her mystery and charm. Panama was on my life's "to do" list. I'm not sure how I am going to top this one off. My husband and I were very close to the decision to move to Panama, because of the great hospitality and for retired people like us, very comfortable living situations. It is also very affordable for us for living there.